After 48 years, I'm finally posting this giveaway brought to you by Soul Lifestyle! :) I'm sure you've all seen your favorite bloggers (Vern, Verniece, Cheyser) in Soul's pretty clothes. 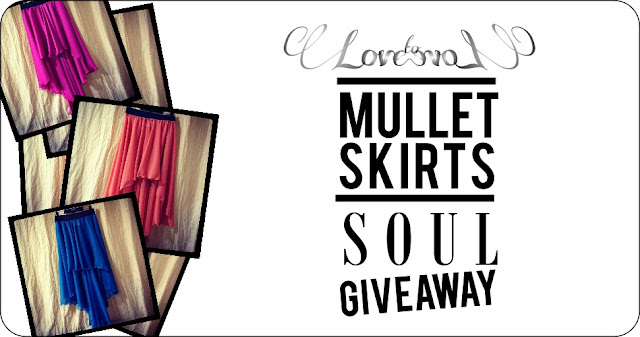 Now one of you might be lucky enough to win 1 mullet skirt from them! :) Woot. 3. Like SOUL on Facebook. 4. Share this giveaway on your blog, twitter or facebook. Don't forget to tag SOUL & me! 5. Leave your name, email and URL of your post below. FB fan - Kasia G.
Thank you Pax and Mimi of Soul Lifestyle! Hi Miss Aisa! Do different post links count as one entry each (e.g. FB=1, Twitter=1, Blog=1)? Thanks!